At the end of March, I had the great opportunity to take a trip to Spain with my wife and her family. My wife’s niece is spending a college semester in Granada, and we traveled out to visit her during her spring break, spending several days in Madrid, Seville, and Granada. I took a helluva lot of pictures during the trip — probably some 500 total — and I thought I’d share some images and thoughts about the trip. The first few days were spent in Madrid, the capital of Spain, and I’ll start with posts about our stay in that city. Many of my pictures are panoramas stitched together with multiple images, so don’t be surprised to see the same person in several places in the same picture, or people who are only half there! 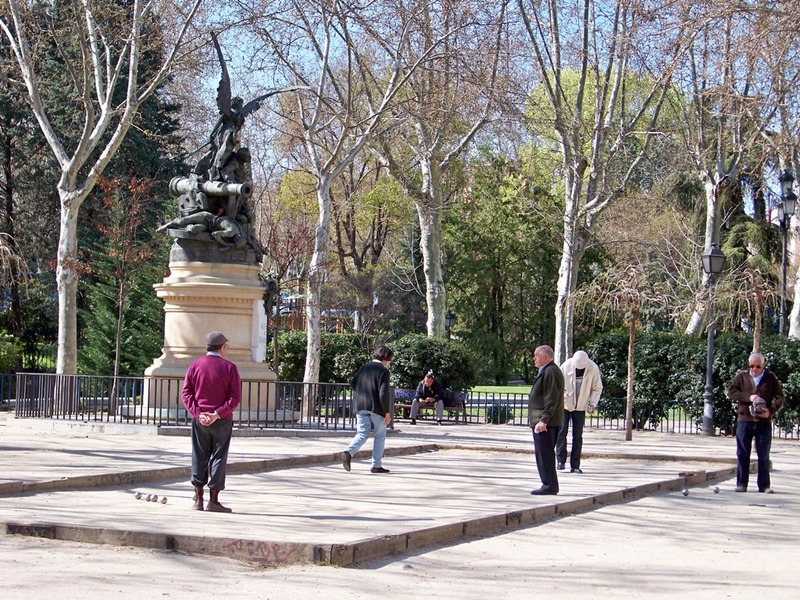 Spanish gentleman playing bocce in the afternoon off of the Parque de la Montana. 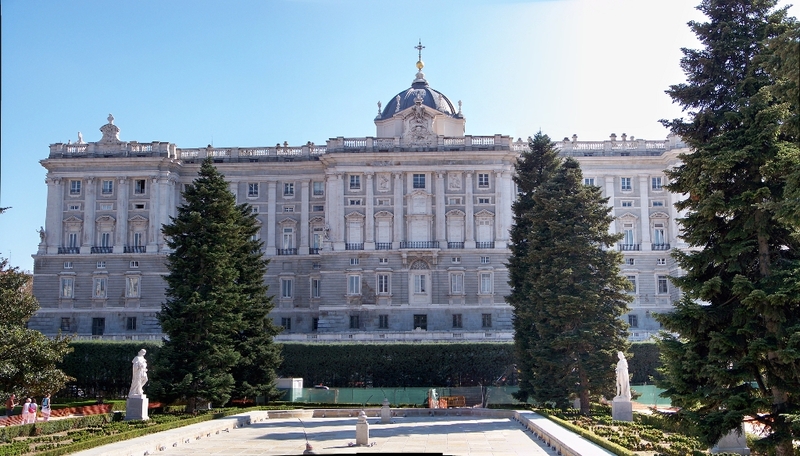 The Palacio Real, from the Sabatini Gardens. This plaza hearkens back to an 1844 design that was championed by Joseph Bonaparte, the brother of Napoleon who was appointed King of Spain. The monument in the center, of Philip IV of Spain, faces the Teatro Real, a major opera house that was completed in 1850. The Plaza Mayor, in the late afternoon. This lovely plaza is the perfect place to grab an afternoon drink or tapas and people watch. It has a long history, dating back to the late 1500s, though the architecture in its current form dates only to the relatively youthful 1790s. 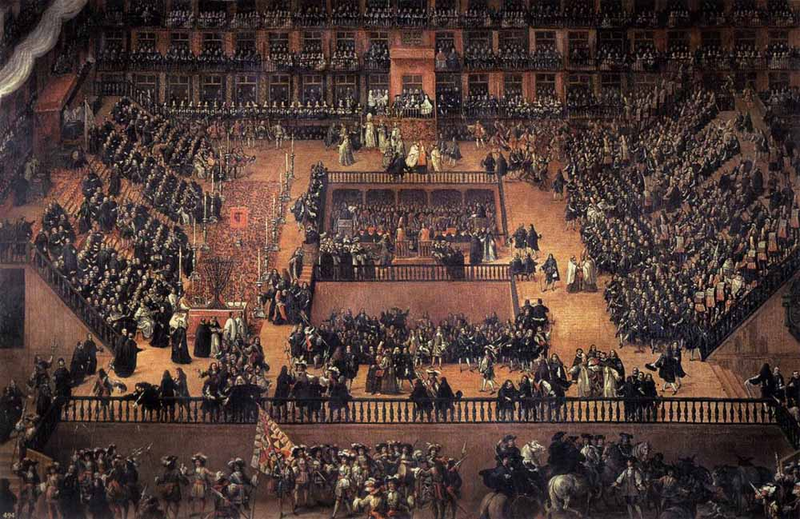 It also has a rather dark and bloody past: the plaza was the scene of bullfights, executions, and even an auto-da-fé of the Spanish Inquisition, as depicted in a painting by Francisco Rizi. This painting is in the Prado Museum in Madrid, and I saw it in person — but more on this later! From the Plaza Mayor, we struck out towards the official center of Spain, the Puerta de Sol. “Sol”, as it is known, possesses a plaque, the kilómetro cero, that represents the symbolic center of Spain. This makes it the focal point of many popular protests, and in fact one was ongoing the day we arrived. The Spanish government is pushing economic austerity to attempt to solve its fiscal problems (a foolish plan, IMHO), including legislation targeting organized labor. 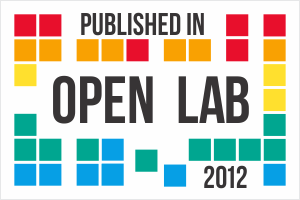 A nationwide strike was called on the 29th of March, and a major protest centered on Sol. 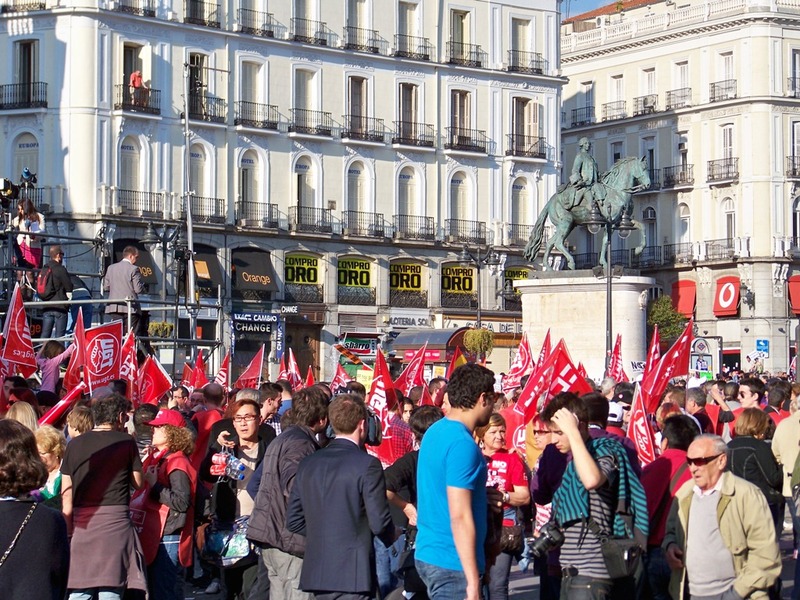 Striking labor workers protesting in the Puerta del Sol. The protests went on into the night, as we would see in a few hours. In the meantime, the wife and I circled back to our hotel to relax for a few more hours. Dinner in Spain is typically held very late — later than 10 pm is pretty common. 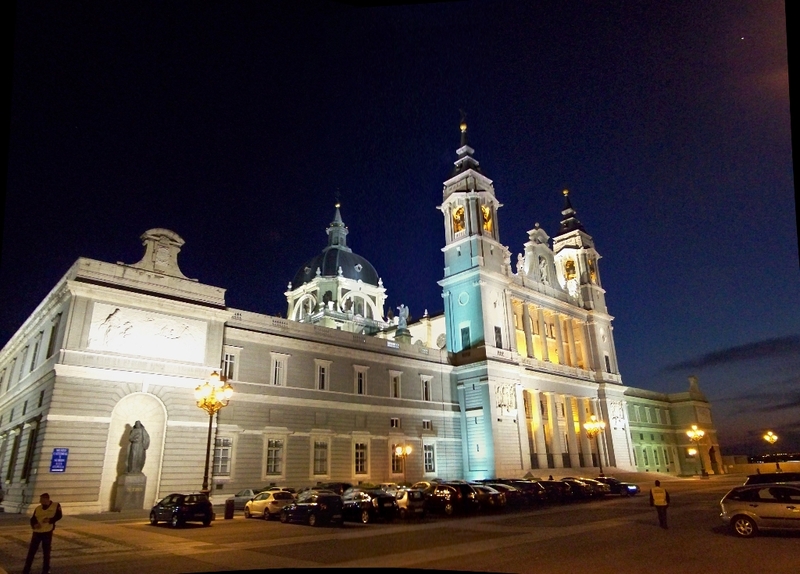 We were happy to participate in the practice (especially since jetlag had put us complete off schedule anyway), and headed out around sunset to a restaurant on the other side of the Palacio Real. Along the way, the wife pointed out a beautiful sunset, and I managed to snap one of the most beautiful photographs I’ve ever taken. 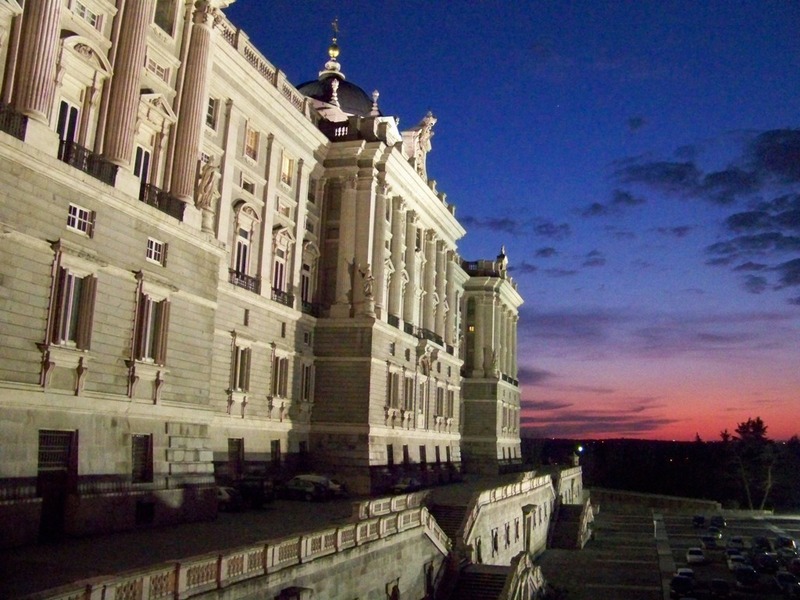 The north side of the Palacio Real, at sunset. I’ll call this picture a combination of luck and my wife’s sharp eye! My camera skills are typically pretty mediocre. The cathedral, which was begun in 1879, was not completed until 1993, when Pope John Paul II consecrated it. We had dinner at the Restaurante El Ventorrillo, which was recommended by our travel guide, and which also had a spectacular view of the rear of the cathedral. 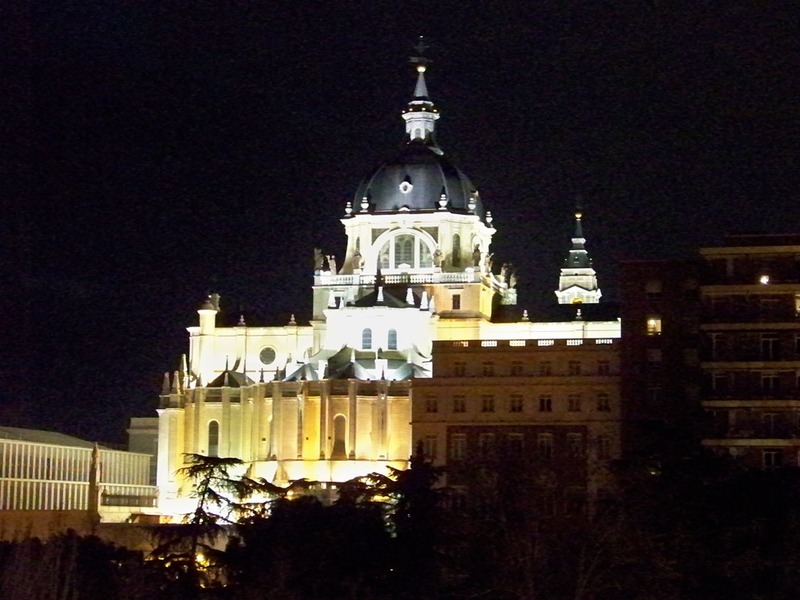 The view of Almudena Cathedral from Restaurante El Ventorrillo. This was our first opportunity to sample real Spanish tapas — small plates of appetizers. We shared plates of Spanish tortillas, croquetas, and incredibly good Manchego cheese. In fact, I would end up basing most of my meals on this combination, as I loved it so much! 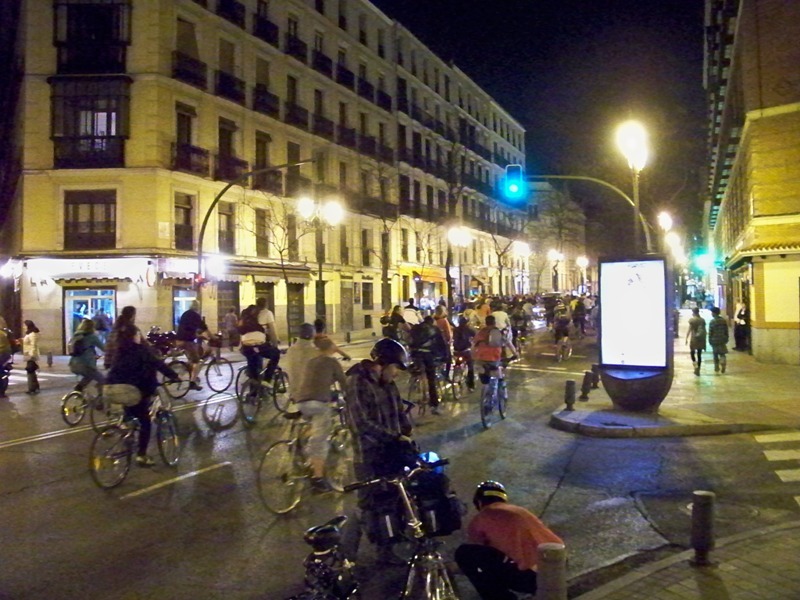 The protests over Spanish austerity went on into the night. While we ate, a bicycle protest consisting of countless bikes and roller bladers passed by the restaurant. This was a truly impressive gathering — I can’t venture to guess how many bicycles were involved, but a steady stream passed by for approximately ten minutes! After dinner, my wife and I decided to call it a night. On the way back to the hotel, we passed the Plaza de España, which has a statue of the Spanish literature icon, Don Quixote, with his faithful sidekick Sancho Panza. 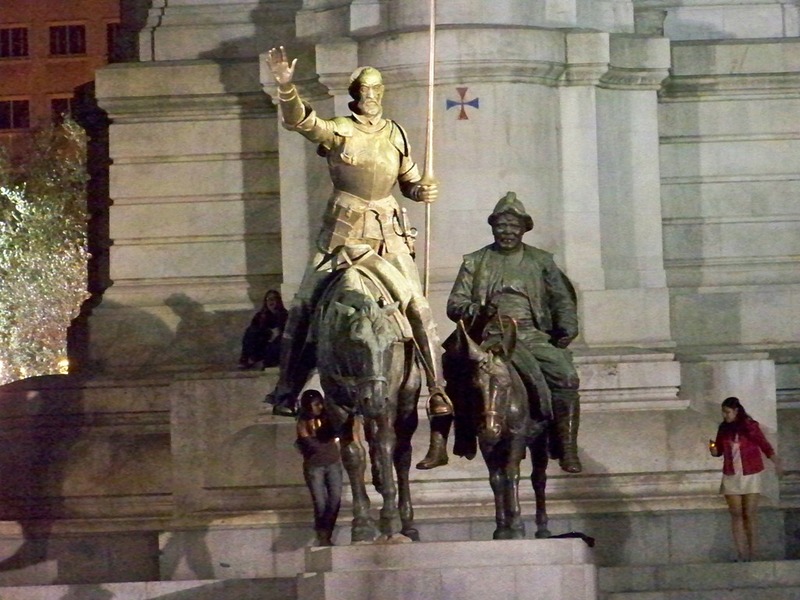 Statue of Don Quixote and Sancho Panza in the Plaza de España, Madrid. This Plaza de España has nothing on the identically-named plaza in Seville, however; but that is to be described in another post! All this was just the first day of our trip! In the next post, I’ll complete my description of our stay in Madrid. The photos are great. It appears that you had a great trip. Yes — it was a wonderful trip! Hadn’t been to Europe in a long time, and it was nice to be back.